Just as I was down in the dumps about the endless gray of winter God called the Witch Hazel in my yard to work it's magic and push open its late winter blooms. 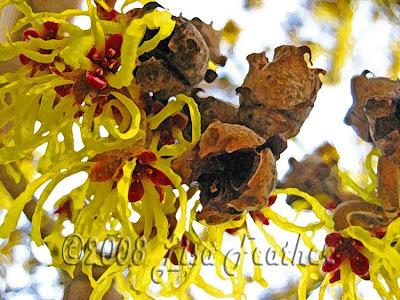 The Witch Hazel is such an interesting plant. It's beautiful pods and bright spidery blossoms look so eager and cheerful, so full of hope as winter draws to a close. I loved the brightness of this image. I softened the details a bit and let the background fade. It speaks to me of bright new ideas and fresh beginnings.